LibreOffice Documentation Team has just released the LibreOffice 6.0 Writer Guide, with a general Introduction to LibreOffice Writer followed by the following chapters: Working with Text (basics), Working with Text (advanced), Formatting Text, Formatting Pages (basics), Formatting Pages (advanced), Print Export Email, Introduction to Styles, Working with Styles, Templates, Images & Graphics, Lists, Tables of Data, Mail Merge, TOCs Indexes Biblios, Master Documents, Fields, Forms, Spreadsheets Charts Objects, Setting Up Writer and Customizing Writer, for a total of 448 pages. 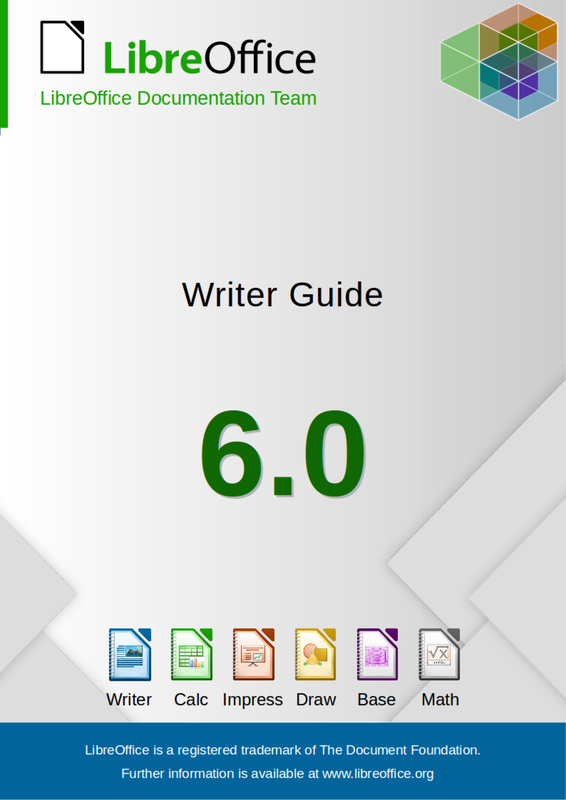 LibreOffice 6.0 Writer Guide is available from TDF Wiki as ODT and PDF, both the complete book and individual chapters, and from ODF Authors as ODT of individual chapters. LibreOffice 6.0 Writer Guide is also available as a printed book from Lulu, by Friends of Open Document Inc., an Australia-based volunteer organisation with members around the world which will be using profits from the sale to benefit the LibreOffice community. Are there plans to bring the documentation for the other parts of LibreOffice up to date? Can I open Smart Suite files (.lwp, .sam) in LibreOffice? Yes, LibreOffice can open Lotus Word Pro files! I inadvertently eliminated my email address from your notification email. Please reinstate me. You are doing a terrific job. I am a senior citizen who grew up on Microsoft and had access to the latest in their software. However, that has no bargaining power with the powerful Microsoft. I was overjoyed when I was alerted to the Libra Office package. Thank you all LibreOffice developers and contributors. LibreOffice has been ultimately useful in my life. It saved me from proprietary office suites and gave me all features I need perfectly. Thank you Italo Vignoli for bringing us this news! Avant j’avais la version 5.4.7 de libre office, depuis la version 6.0.6 je ne peux plus rien imrimer que ce soit en version 32 ou 64 Bits, et cela ne viens pas de mon imprimante, car d’autre logiciel en 32 et 64 bits sont installés et je n’ai pas de problème, et enregistrer en permanence en PDF n’est pas la solution, alors peut être faudrait il revoir cette version pour les suivantes afin qu’il n’y aie plus ce problème ! Croyez vous cela possible ?? car j’adore Libre Office, malheureusement j’ai du installer à la place Open Office 4.1.5 qui lui fonctionne et imprime sans problème !